Posted on September 13, 2016. Subscribe to our blog by email. Welcome to the September 2016 issue of the Global Washington newsletter. In 2015, 65.3 million people around the world were displaced. This is greater than the combined population of Canada, Australia and New Zealand. While Syrians represent the largest percentage of those displaced, numerous others are fleeing war and fragile civil societies in South Sudan, Yemen, Burundi, Ukraine and Central African Republic, in addition to thousands more fleeing poverty and violence in Central America. Countries lacking strong civil societies, termed “fragile states,” are home to 43 percent of the global population. This is a global crisis. It will be top of mind for world leaders when they gather this month at the United Nations General Assembly. In addition, President Obama has called for a White House Summit on Refugees to address the myriad of political, social and economic issues associated with mass migration. Political leadership is an essential part of the solution. Several Global Washington members are on the front lines of the refugee crisis, addressing its root causes. We will be raising the profile of members who work on this issue and providing a “Seattle response” to world leaders gathering in New York and D.C. Please join us on September 14 along with experts from the International Rescue Committee, Oxfam America and Americares for a timely discussion on this topic. I hope you will read on to learn more, attend tomorrow’s event, and add your voice as we tackle this global crisis. Is your organization putting on a big event this fall? Gala? Luncheon? Annual dinner? Tell us about it! We’d love to help spread the word. Every minute, 24 people are forced to leave their homes. While large numbers, such as 65.3 million people displaced worldwide in 2015, can often be hard to comprehend, 24 people equals a group of co-workers, friends or classmates. Now imagine 24 people displaced every minute of every day, and every day of every year. That is the magnitude of the current migration crisis, and it is a problem unseen since the Second World War. According to the United Nations High Commissioner for Refugees (UNHCR), the breakdown of 65.3 million displaced persons in 2015 equals 40.8 million internally displaced persons, 21.3 million refugees and 3.2 million asylum seekers. There were 12.4 million people newly displaced in 2015, and 10 million were stateless. The forcibly displaced population today is larger than the total population of the United Kingdom. If those displaced all lived in one country, that country would rank 21st globally by population. And half are children who are often forced to migrate alone. A majority of those displaced, 86 percent, are from low and middle-income countries and are close to conflict. More than half, 54 percent, are from either Syria, Afghanistan or Somalia. What causes this mass migration? Sometimes it’s natural disasters, which have affected 218 million people over the last two decades. Often people face extreme war and conflict, which drives 80 percent of humanitarian need. Fragile states are home to 43 percent of the global population, 76 percent of whom live in extreme poverty. Two-thirds of the countries considered to be fragile states did not meet Millennium Development Goal 1, which aimed to eradicate extreme poverty and hunger by 2015. If these states cannot reduce conflict and build good governance by 2030, 62 percent of the people living in fragile states will be living on less than $1.25 a day. One example of a fragile state is Syria, which has been in conflict since 2011. At the end of 2015, 13.5 million people were in need of humanitarian aid, including 6.5 million people who were internally displaced. This ongoing crisis, which has caused so many to flee, has had devastating effects on the Syrian people. Life expectancy has been slashed by more than 20 years, school attendance has dropped by 50 percent, and the country’s economy has contracted by 40 percent. Countries housing displaced persons are struggling to cope with the influx of people. In 2015, over 1 million crossed into Europe, with 90 percent heading to Turkey, Pakistan or Lebanon. Turkey alone hosted 2.54 million refugees in 2015. According to the International Organization of Migration, 1 million migrants traveled by sea in 2015, and nearly 35,000 by land. Since 2000, 46,000 people have died migrating, with 10,400 of those dying in 2014 and 2015 alone. While aid has increased over the past three years, reaching $28 billion in 2015, the United Nations (UN) was unable to meet 45 percent of country appeals for assistance last year. In May 2016, UN Secretariat General Ban Ki-Moon hosted the World Humanitarian Summit in Istanbul, Turkey to address how to best reduce refugee and migrant suffering and improve aid delivery. Out of this summit came the Grand Bargain (GB), which pledges to increase funding to local organizations from the current 2 percent to 25 percent by 2020. In addition, the GB is asking donors for more flexibility on where humanitarian aid dollars go, and in turn aid agencies will be more transparent with how donation dollars are spent. Ban Ki-Moon has also ordered the Summit for Refugees and Migrants to take place this month to bring together heads of state and create a blueprint for a better-coordinated international response to the migration crisis. Parallel to the 71st session of the UN General Assembly, President Barack Obama will host a Leader’s Summit on Refugees. During this September summit, states will commit to broaden and deepen their commitment to funding UN humanitarian appeals, expand resettlement and other legal channels for humanitarian admissions, and facilitate refugee inclusion and self-reliance. Meanwhile, several Global Washington members are focused on the 24 people being displaced every minute, and continue to provide humanitarian aid to those 65.3 million people displaced worldwide. As families search for safety across the Middle East and Europe, the global Red Cross network is providing vital humanitarian assistance to those in need. Red Cross and Red Crescent teams are serving tens of thousands of migrants and refugees, including along the Mediterranean and Western Balkans migratory routes in countries of origin, transit and arrival. This critical assistance includes the distribution of food, water, hygiene kits, baby supplies, clothing and first aid kits. Red Cross and Red Crescent teams are also providing medical care and first aid, shelter and psychosocial support. Additionally, migrants who have been separated from their family members have been receiving assistance from the Red Cross Restoring Family Links program to reconnect with their loves ones. Among its current programs, Americares is helping vulnerable people caught in the Syria conflict, refugee communities in Jordan, families negotiating the border crisis in the United States, and people in the West Bank, Gaza and Lebanon who have difficulty accessing health services. By providing support to local partners in these communities, Americares is helping refugees and others access critical health care. In Syria, aid from the organization includes more than $7 million in medicine and supplies and support including staff salaries for health facilities that have been targeted by violence. With medicine for diabetes, cardiovascular disease and other chronic conditions, Americares continues to collaborate with partners in the West Bank, Gaza and Lebanon, to help them meet the health needs of vulnerable populations. On the U.S.-Mexico border in Texas, Americares has supplied a structure where families can safely spend the night and access health care after an often lengthy and dangerous journey from Central America. Nearly 10,000 people have used the facility so far. Along with national governments, the United Nations High Commissioner for Refugees (UNHCR), other NGOs and funding partners such as the Bill & Melinda Gates Foundation, Medical Teams International is responding to mass migration/refugees fleeing conflict and disaster with healthcare service and support in Uganda, Lebanon, Greece, and soon Turkey and Tanzania. With a sudden, recent surge in violence in South Sudan, close to 90,000 more refugees are fleeing to camps in Uganda adding to the 300,000 refugees already being served in Uganda. With over 700 Ugandan healthcare staff, Medical Teams is the UNHCR preferred healthcare provider. Medical Teams’ work includes health intake for all incoming refugees, triage, direct healthcare as needed, WASH, Maternal Child and Newborn Health services, nutrition supplementation and work to treat and prevent malaria, and cholera. Over 85% of new refugees are women and children. Powered by the belief that a better world is possible, Mercy Corps partners to put bold solutions into action, helping people triumph over adversity and build stronger communities from within. This means not only delivering lifesaving assistance like food, water or shelter increasingly through cash, but also tackling root causes like communal tensions and hatred, discrimination, gender inequity, social exclusion, lack of opportunity and how life-shaping decisions are taken by power-holders. It means meeting today’s urgent needs while investing in a more resilient tomorrow. Mercy Corps strives to innovate for greater impact, and they understand that communities are the best agents of their own change and local markets are the best engines of long-term recovery. Today, Mercy Corps’ staff of nearly 5,000 is reaching about 30 million people in more than 40 countries around the world. NetHope is an organization that convenes the world’s largest international non-profit organizations (NGOs) and technology giants to help tackle global challenges. NetHope, a 49-member organization, is a catalyst for productive innovation and problem solving in humanitarian crises and conservation work. NetHope is currently engaged in providing Wi-Fi to refugees fleeing persecution, conflict and famine. RenegAID develops educational materials to help people understand catastrophe trauma and learn the differences between everyday language and the language of survival and regeneration. Disaster policies, procedures and plans are cognitively developed prior to a catastrophe. The language of survival and regeneration is not a cognitive language, but rather a language spoken by survivors within disaster. RenegAID advocates for those who speak the language of survival and regeneration, and believes their leadership is key to overcoming the difficulty that aid organizations face in scaling up and delivering timely relief. The catastrophic mass migration our world is currently experiencing cannot be managed using procedures mitigated in past disasters or written in less confusing times. This catastrophe can only be managed by appreciating the existence of two distinct languages and the indispensable leadership from survivors themselves. Sixty-five million children around the world are on the move – running from conflict, poverty and extreme weather, looking for a better life and a place to call home. They are among the most vulnerable people on earth – children on the edge. UNICEF is working on the ground to ensure that programs and policies in response to the migration crisis put the rights and needs of all children first. It is also working to expand humanitarian services wherever they are needed on refugee routes, including providing water and age-appropriate food, and establishing child-friendly spaces, where children can play and benefit from psychosocial support, and women can rest and take care of their babies. At the same time, millions of children are still caught in situations of conflict, natural disaster, poverty and underdevelopment – the main root causes of the crisis – and UNICEF remains committed to supporting sustainable solutions where they are needed most. World Vision has worked in the majority of the world’s fragile states for over three decades to support the most vulnerable children and communities. 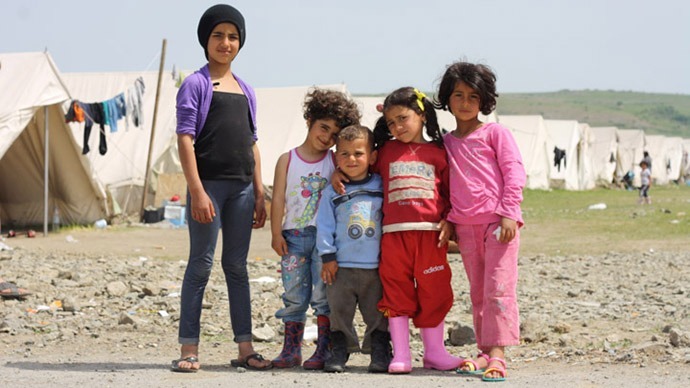 Since the start of the Syria crisis, World Vision has helped more than 2 million children and adults in Syria, Lebanon, Jordan, Iraq, and now Serbia. In addition to meeting urgent relief needs, the organization works in the world’s broken places on the root causes of fragility that perpetuate extreme poverty and drive conflict and forced migration. From places like Syria and Iraq, to Afghanistan, Somalia and South Sudan, World Vision partners with communities, governments and generous donors to provide food, clean water, child protection, education, jobs and health support. They work for lasting change in the lives of children and the poorest, in the hardest places. Read the recent article from World Vision International’s President and the UN’s Emergency Relief Coordinator on reducing humanitarian needs in fragile states. 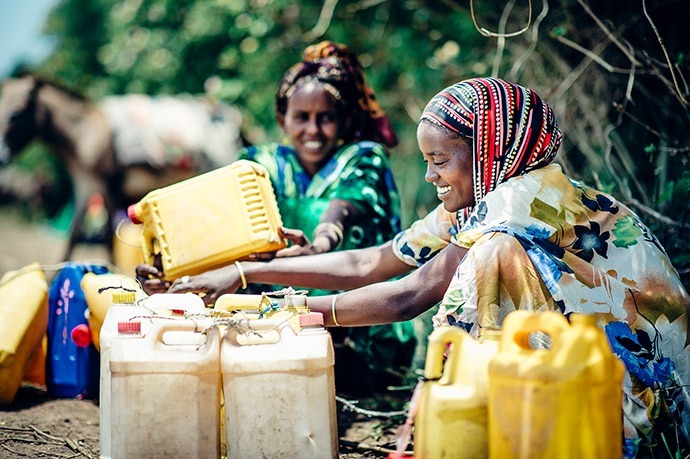 Mercy Corps has helped women in the small village of Jijiga, Ethiopia begin processing milk locally. It is now a higher quality, improving incomes for pastoralists and their families. Mercy Corps has been delivering humanitarian aid and rebuilding communities since 1979. Michael Bowers, Vice President of Humanitarian Leadership and Response for the Portland-based NGO, believes the mission to alleviate suffering, poverty and oppression by helping people build secure, productive and just communities, has been instrumental in guiding the organization to success. A Mercy Corps team member on the island of Lesvos, Greece shows a map to a group of refugees to help them navigate their location. Bowers explained that, during its 37-year history, Mercy Corps has learned that for every year of war/conflict, it takes seven years for a country to recover. 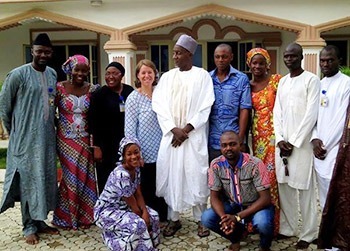 Additionally, Mercy Corps has learned unless the root cause of a conflict is resolved, violence will continue to reemerge and the country will remain fragile. Bowers described unstable countries as having unequal distribution of resources. “The sustaining factors of a healthy and peaceful society require that grievances are addressed fairly, there is good governance and an equal opportunity for economic growth,” he said. 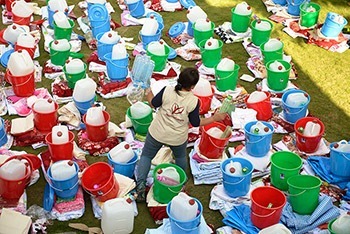 A Mercy Corps team member prepares emergency kits to distribute in Kathmandu, Nepal following the devastating earthquake in April 2015. Humanitarian crises are on the rise and there are more displaced people today than at any time since World War II. 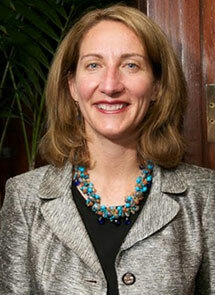 Nicky Smith, Executive Director of International Rescue Committee (IRC) Seattle, is no stranger to these growing crises. As a humanitarian aid worker she responded to the Rwandan Genocide, the Liberian Civil Wars, and worked in Afghanistan during Taliban rule. And those are only a few of the challenges Smith experienced firsthand. Her year in Egypt, Smith explained, was life-changing. 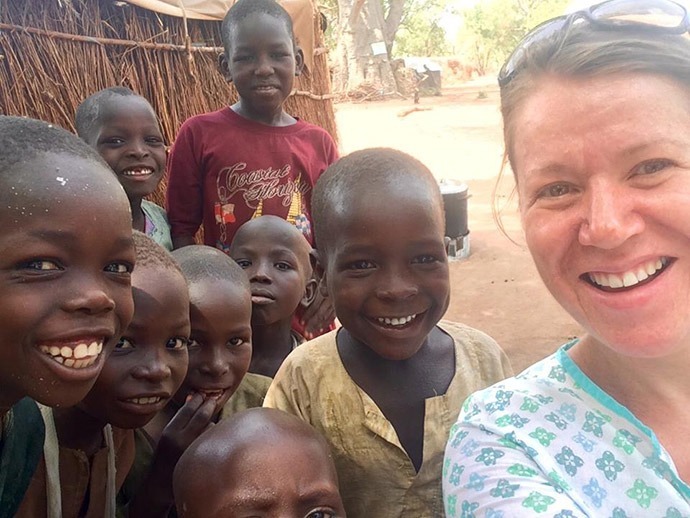 She decided not to attend college and instead started working in international development. Her first job was with Project Trust, managing programs in Uganda. “I will never forget this,” Smith says of the experience. “I was sitting in a camp in Mbarara, Uganda in April of 1994 when the people there started telling me about this thing that was happening across the border in Rwanda – and that thing was the Rwandan Genocide.” Smith describes this as a seismic moment in her life. She decided she needed to go to Rwanda and would shift from development work to humanitarian work. Deciding she wanted to move beyond medical emergency relief, Smith left MSF and went to work for IRC where she has been for the last thirteen years. She has held a variety of roles and worked in various countries, including Sudan, Congo, Philippines, Nigeria and Iraq. She has also done advocacy and policy work for IRC in Washington, D.C.
Smith, who now leads the IRC team in Seattle, explained that she became drawn to the IRC’s U.S. programs because she wanted to help refugees rebuild their lives here in the states. She aims to raise the profile of IRC’s work in Seattle, which in turn will help raise funds to provide more services to resettled refugees. “It feels really natural to be working in U.S. programs,” said Smith. “I have an excellent staff, 45 percent of whom are former refugees. 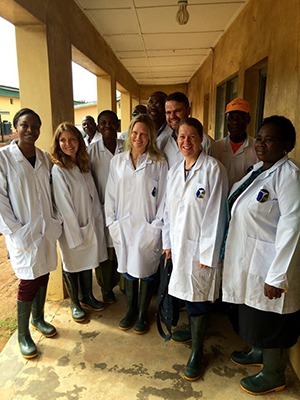 I feel like I hit the lottery with the Seattle office.” Smith explains that her years of working abroad in conflict countries has helped her be effective in her current role.